Vimeo is considered as one of the biggest sites for video sharing where you can find videos. Sometimes it may be possible that you want any video song into MP3 format, so that you can easily play it later on your own device without browsing the site. At that time you need to have an MP3 converter which can convert the Vimeo videos to MP3. So, if you want to know how to download and convert Vimeo videos to MP3, we are going to share some of the best ways to convert Vimeo videos to MP3. Vimeo to-Mp3 is a free online video converter, it can convert any Vimeo video without asking for registration data. All you need is the link, and you are set. Visit Vimeo to-Mp3 and find the Vimeo video that you want to download. The first step is always the easiest. Just find the Vimeo video that you want to convert. Copy and Paste Video URL into the box. Once you have the URL that you want to download from Vimeo video to MP3 file, you can paste it into the URL/Link box in order to begin the conversion. Before beginning the conversion process, you are going to want to sift through the settings in order to make sure that you get the MP3 the exact way you want it. Your setting options include audio quality, start and stop points, as well as editing the artist and title of your MP3 file. Once you have the Vimeo link you want, and the settings are setup to your liking, you just need to click the Start button and you are on your way to having a downloading a Vimeo video to MP3. Once the Vimeo video is converted to MP3 you will be given a download link which you can follow in order to receive your converted MP3 file. Any Video Converter software is a simple way that you can change your Vimeo video into an mp3 and with no cost for the software. The supported video formats with this program are extensive and it converts quite quickly. Download the program Any Video Converter . Download and install this software on your PC first, and then run it. Go to Vimeo to search the video you want to download. When you find out the Vimeo video you would like to download, please simply copy the URL(s). Paste the link to Any Video Converter. Click on the Add URLs button, and paste the download link in the pop up dialog box. You can continue to paste more Vimeo video links as the previous steps. Before downloading Vimeo videos, press Online Video Tab, then simply select the video format and quality to download. Click “OK” to start downloading Vimeo videos. Wondershare Video Converter Ultimate is one of the best online video converters that also comes with a full studio suite. It also comes with a considerably up to 30x faster conversion speed than other types of free conversion programs and hundreds of output formats. Copy the video link you want to download to MP3. 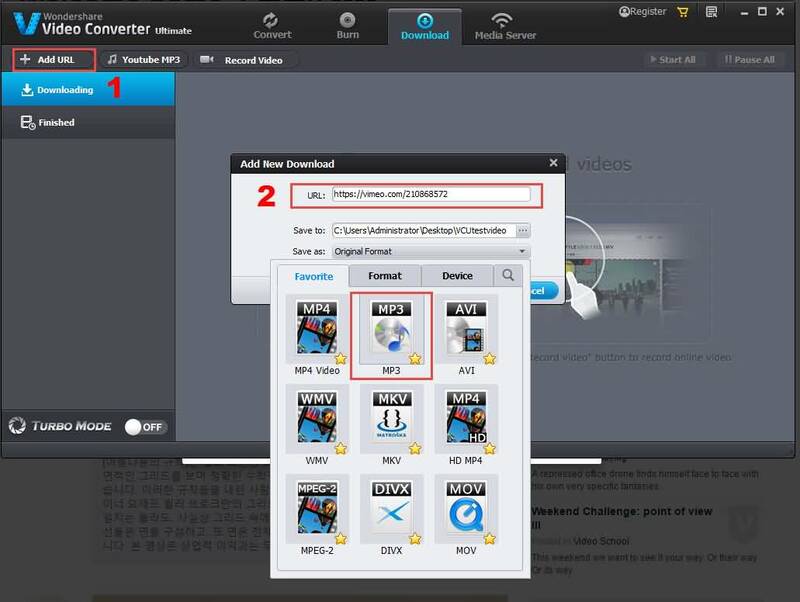 Launch the Wondershare Video Converter Ultimate and start to download. 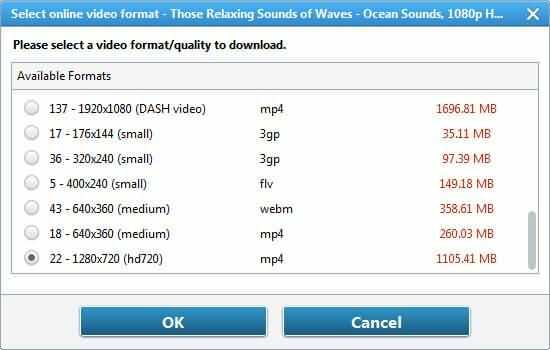 Run the program and go to the download tab then paste the direct link to the video and select mp3 as the output settings. The program will work to download and convert your video. You can even convert several videos to mp3 at once with the option to pause and resume conversion if needed. When the file is complete you can manipulate and edit the mp3 as needed or simply listen to it without the need to have Vimeo open! Awesome! Extremely helpful! Thanks a lot! I used to save vimeo video as mp3 song for my iPod with a web-based app calls Acethinker video downloader, It's an online software to download online videos, works pretty well for me. Share it here as an alternative method.